The new GLC Coupe gets new engine options, dominant styling and more safety tech. Just a few weeks after pulling the wraps off the 2020 GLC, the German marque has now presented the new Coupe version of the SUV as well. Those familiar with the new 2020 GLC will immediately notice that the Coupe dons a completely re-designed front fascia. Apart from the LED headlights, all components up front are new. The Coupe ditches the dual slat mesh grille of the SUV for a diamond single-louvre grille with the bold three-pointed star taking centre stage. The front end has been made much more dominant with a new bumper which houses a bigger and wider air dam with a chunky underride guard occupying the lower-mid section. At the back, the new GLC Coupe gets LED tail lamp units which bear the design hallmarks of those used in the SUV. However, the chrome strips lining the top of the taillights do look synonymous to an old person's white eyebrows! Apart from that, the signature high-riding rear profile is made more butch via the huge air diffuser flanked by the exhaust ends on either side. The chrome surround running over the diffuser and the exhaust tips does look nice indeed. The biggest change inside is the introduction of the MBUX infotainment system which offers a 12.3-inch digital instrument cluster along with two 7-inch and 10.25-inch displays located on the centre console. The multifunction touchpad also replaces the rotary pushbutton, while the Coupe also gets a completely revised multi-function steering wheel in two versions. For the international markets, the GLC Coupe gets a more sophisticated suite of safety features, which now includes exit-warning function, emergency-corridor function and Trailer Manoeuvring Assist. 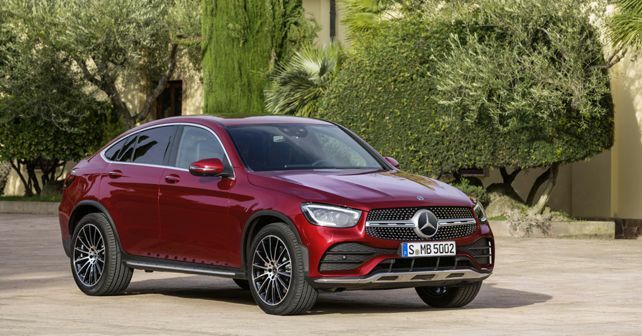 At the time of its launch, the GLC Coupe will be offered with new engines and more options are likely to be added post a few months of the launch. The engine line-up includes four-cylinder petrol and diesel motors from Mercedes' current generation wherein the petrol motors are electrified via the integration of a 48-volt onboard electrical system (EQ Boost). While all the models will offer the 4MATIC AWD setup, the GLC Coupe will go on sale with two petrol variants (GLC 200 4MATIC, GLC 300 4MATIC) and three diesel variants (200d, 220d and 300d) on offer.